This is the second piece in the Swamp Things Collection, which I created in response to a call for artists from the Art Supply Depō in Bowling Green, Ohio. 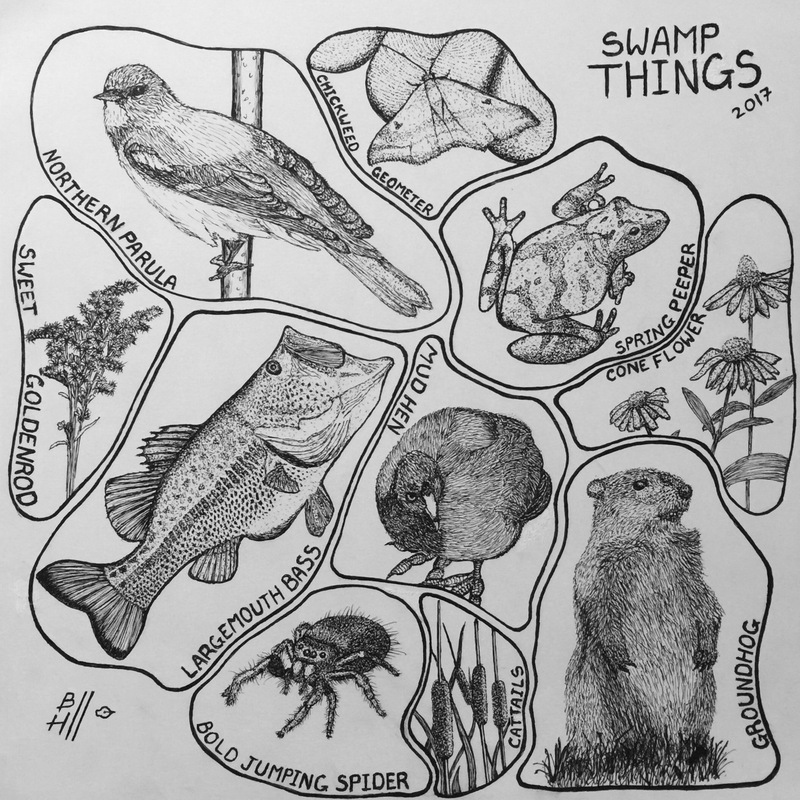 All of the creatures pictured in the collection are native to the Great Black Swamp region, and are not drawn to scale relative to one another. I’d originally planned three pieces, but I ran out of time before the deadline, so only the first two were submitted. I’m still planning on creating the third for posterity. I wasn’t initially happy with this piece. You wouldn’t necessarily know it just by looking at it, but it’s production fell well outside my normal approach. Aside from there being no abstract components, I (mostly) drew the frames to fit the flora and fauna, so I could draw the entire corpus. Usually, I start by creating a series of frames in arbitrary shapes and sizes, then fill them in with material (which is why, in other works of mine, many of the realism elements are trimmed to fit.) It was surprisingly disconcerting to work this way, and led me to make a number of substantial mistakes. They are disguised to the best of my ability, but aren’t completely invisible, and might require further work. There’s also far more unused white space in the frames than I’d normally like to leave available. And to be be candid, I added the title at the last second in an effort to meet the submission deadline, rather than draw another animal in the corner. I probably won’t take that approach again in the future, though it works reasonably well here. However, on balance, I think it’s decent overall. The individual plants and animals (which were mostly chosen based on the delightfulness of their names) are about as good as I can make them, at least at this point in my drawing career, and that’s pleasing to me. It was exciting, if a bit nerve-wracking, to be creating pieces to submit to the judgement of artists for whom I have a great deal of respect. I don’t know if my submissions will get accepted, but I don’t have any regrets about putting in the effort.